I decided to brighten a cloudy day in my summer best — a striped seersucker dress with bow details on the back and a straw clutch with palm leaves. I’m not quite done with summer yet! I had a fun evening of beauty and bubbly with Peter Thomas Roth, discovering some of his newest products. I’m such a huge fan, and it’s always a joy to hear him talk about new technologies. My inner science girl geek loves new beauty formulas. Afterwards, I met up with Andy for dinner at David Burke’s Fishtail — we were in the mood for seafood. Plus, the lobster dumplings are to die for. When I saw this cute summery dress with a bow tie in the back, I knew I had to order it. Ooh la la Boutiques is a women’s clothing boutique and online retailer offering an eclectic mix of clothing, and accessories from emerging and established brands. Ooh la la has six locations located across Long Island, with their entire collection featured on their website www.oohlalaboutiques.com. …and a snap of some beauty fun! I’ve been itching to dye my hair, and yours is so gorgeous! Lovely post! That dress is just so cute on you! That clutch is gorgeous! Thank you! I’m so obsessed with the clutch! 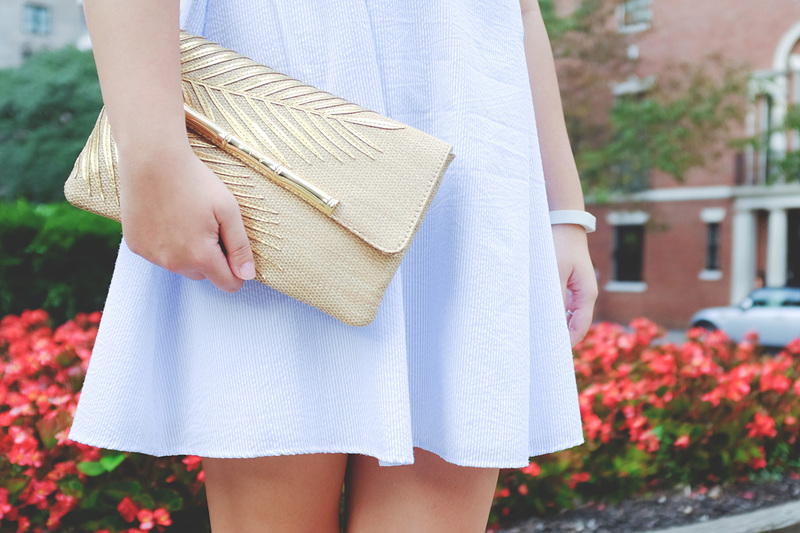 This clutch makes me want summer to never end! Such a cute summer dress! Hmm seafood…yumm!